View of the main entry (left) and open living and dining areas (right), with deck access in the far back. 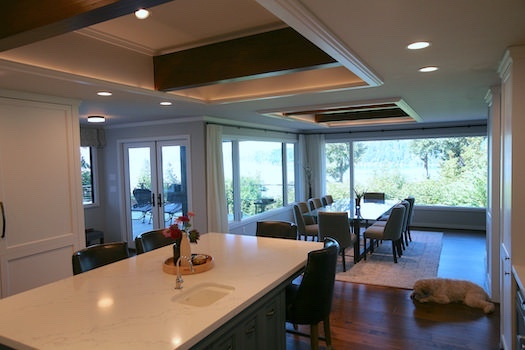 The client for this whole-house remodel project purchased a two-level house in poor condition that had stood vacant for several years but was well situated, with views of Lake Sammamish. 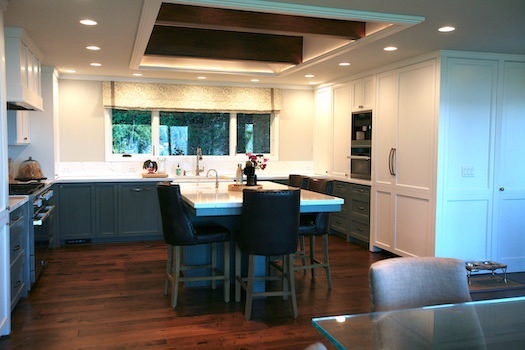 To transform it into their dream home, they hired CASA to overhaul the structure and exterior surfaces, rework its interiors, and completely replace all mechanical and electrical systems. The existing structure consisted of a main level and daylight basement with two-car garage. 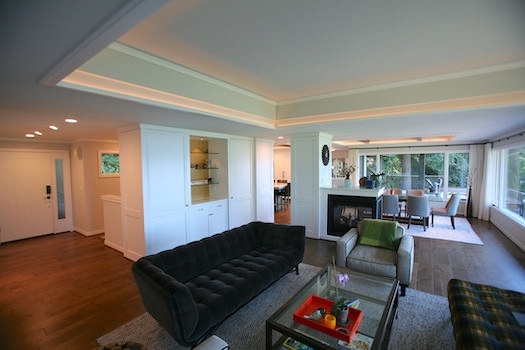 The client wanted an open plan with vaulted ceilings and sweeping views of Lake Sammamish wherever possible. Each interior level was to have direct access to a rebuilt multi-level deck facing the lake. 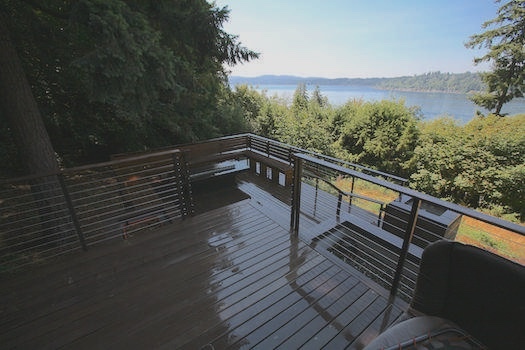 The rebuilt deck was to include a covered upper level for year-round use, with stairway access to a middle level with fire pit and a lower level leading to the yard. The roof, exterior siding, windows, and doors were all to be replaced. An existing porte cochere and the main entry were to be updated. Reworked main entry with a larger foyer, rebuilt main staircase, and coat closets. Living room, dining room, and a powder room bath. All new kitchen with walk-in pantry, eating nook, and direct access to a covered outdoor cooking and eating area on the upper deck. Master suite including bedroom with lake view, bath, two walk-in closets with dresser storage, and home office. The bath was to include his and hers vanities, toilet enclosure, large walk-in shower, and sitting tub with a view. 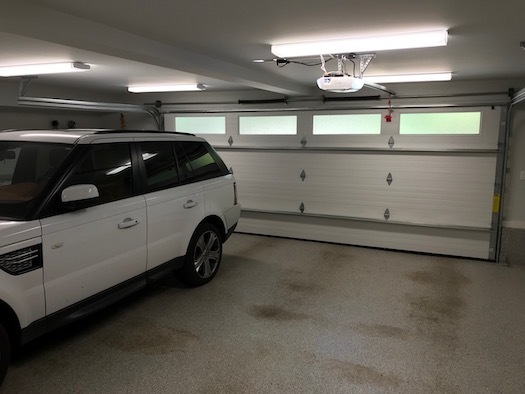 Restructured two car garage with a wider door (18 feet) and general storage — a post in the existing garage that restricted access was to be removed. 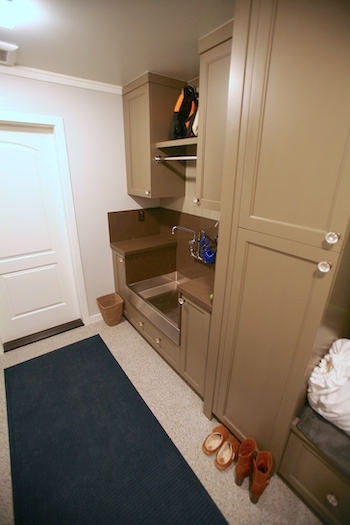 New mud-room entry with dog wash basin, general his and hers lockers for coats and shoes, and laundry. Media room with access to the lower deck and a view of the lake, to include wet bar and display cabinets as well as infrastructure for extensive audio/visual equipment. Two guest bedrooms with views of the lake or access to the deck. 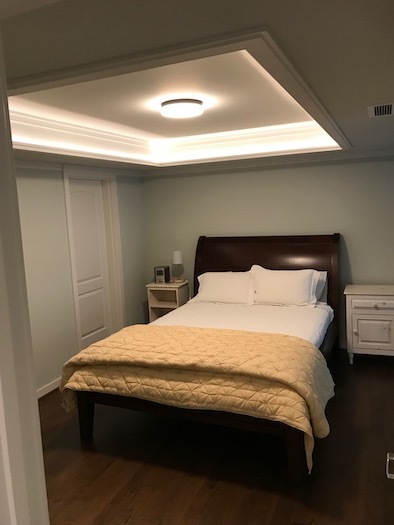 The most significant part of this project was creating an overarching architectural design to integrate the various features and amenities requested by the client. 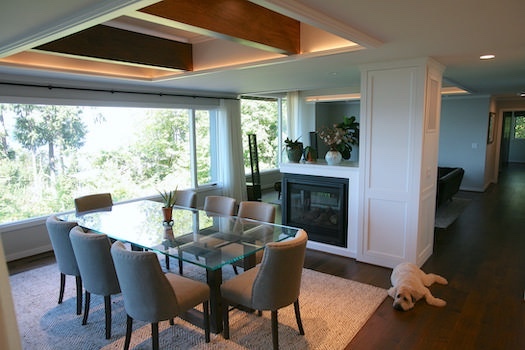 On the main level, it involved raising the ceiling and creating the sense of one large space, then articulating it with coffered ceiling features, view windows, and carefully positioned elements, such as the three-sided fireplace shared by the living and dining areas. The result is a series of five spaces that flow from one to the other yet remain distinct: entry, living, dining, kitchen, and a nook that opens to the upper deck. Lake views are available throughout, a priority for the client. The sense of space and the architectural detailing developed in this main living area was then applied to the master suite and the lower level. Less visible but equally important was the replacement of the home’s mechanical, electrical, and HVAC systems, all headquartered now in a mechanical room off of the garage. The heating system uses a two zone system for separate temperature control on each level. The main level also has air conditioning. 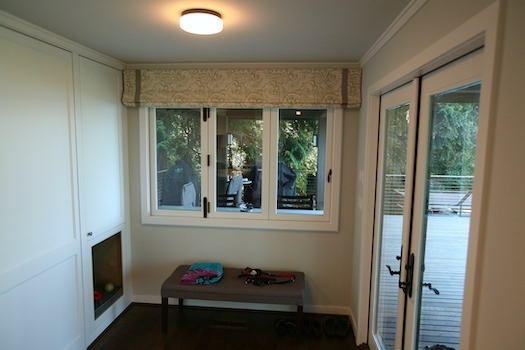 All enclosed areas have separate return and supply ducts for complete air circulation. 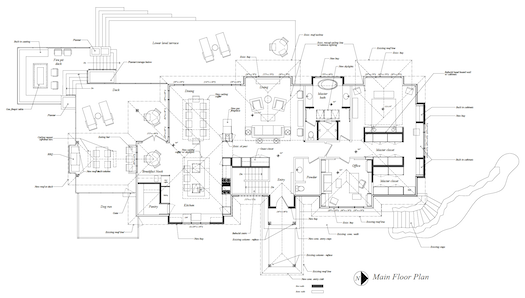 Floor plan of the remodeled main level. Download high-resolution PDF. 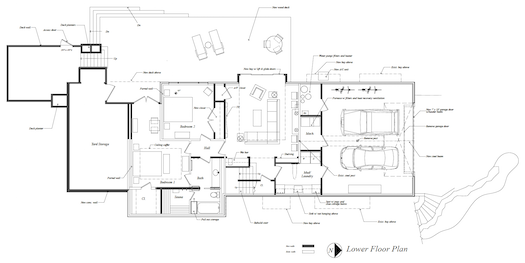 Floor plan of the remodeled lower level. Download high-resolution PDF. View of the main entry and open living and dining areas. In the far back is access to the deck. Formal dining room seen from the kitchen eating nook. The fireplace punctuates the transition to the living room behind. View from the center of the kitchen toward the dining room and upper-level deck. 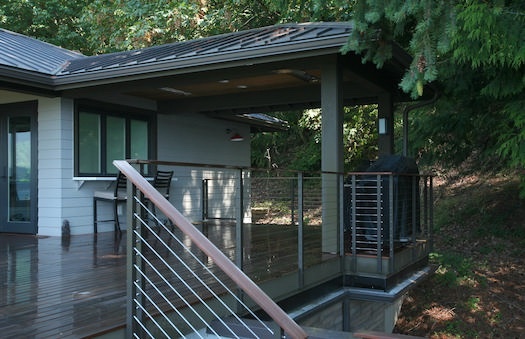 Upper-level deck and covered, year-round outdoor cooking area with infrared heaters in the ceiling. Also visible is the new metal standing seam roof with leaf-guard gutters. Steps to the middle-level deck and fire pit. 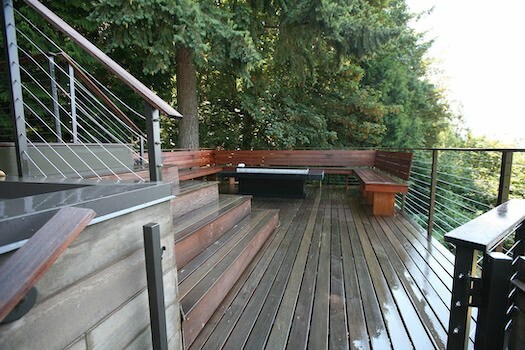 Middle-level deck with seating area and gas-lit fire pit set in a table. Nook next to the kitchen with deck access and built-in dog niche (lower left). 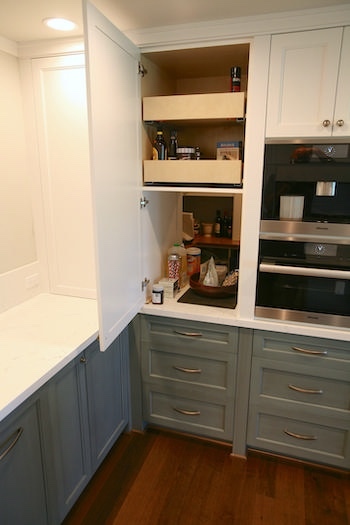 Kitchen pantry and pass through. U-shaped kitchen with large island, seen from the dining area. 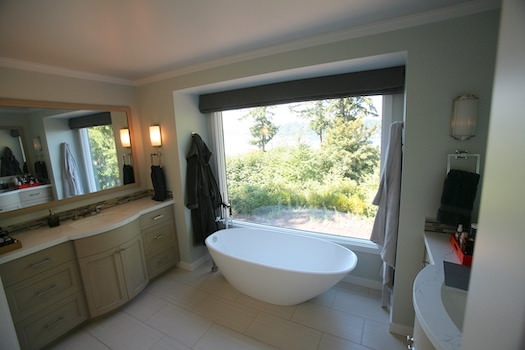 Master bath with sitting bath, view window, and vanities left and right. 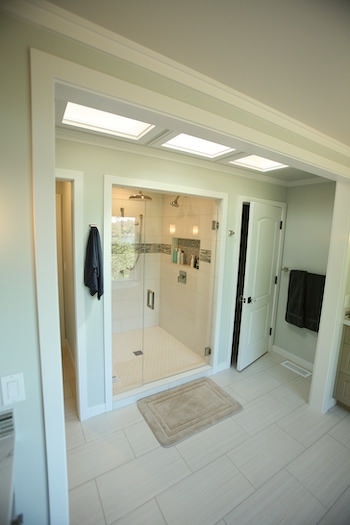 Walk-in steam shower in master bath. 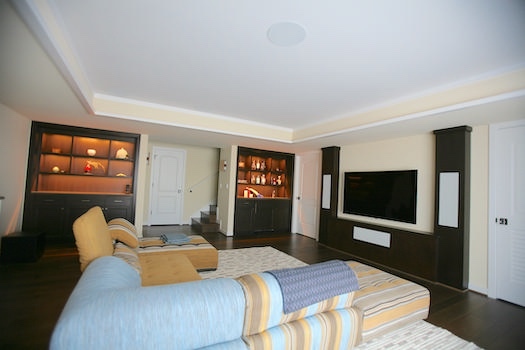 Media room with built-in display cabinetry, large curved screen, wet bar, and hidden storage for audio-visual equipment. One of two guest rooms on lower level, accessible from the media room. 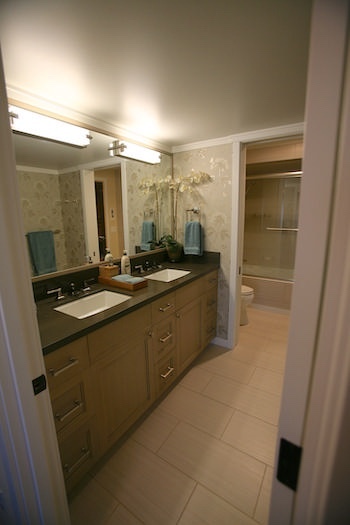 Shared guest bathroom with double vanity and separate toilet and bath/shower enclosure. 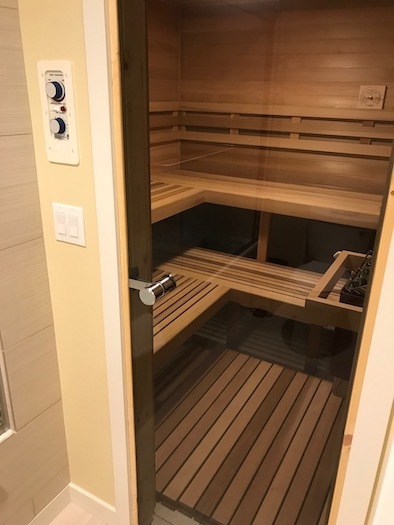 Sauna right off the guest bathroom. Mud room with dog-washing station. The door (upper left) leads to the garage. Widened two-car garage on lower level. Ceiling was reinforced with steel beam to remove post that restricted access.